PIEAS University Fellowships 2019 for HEC Funded Project. 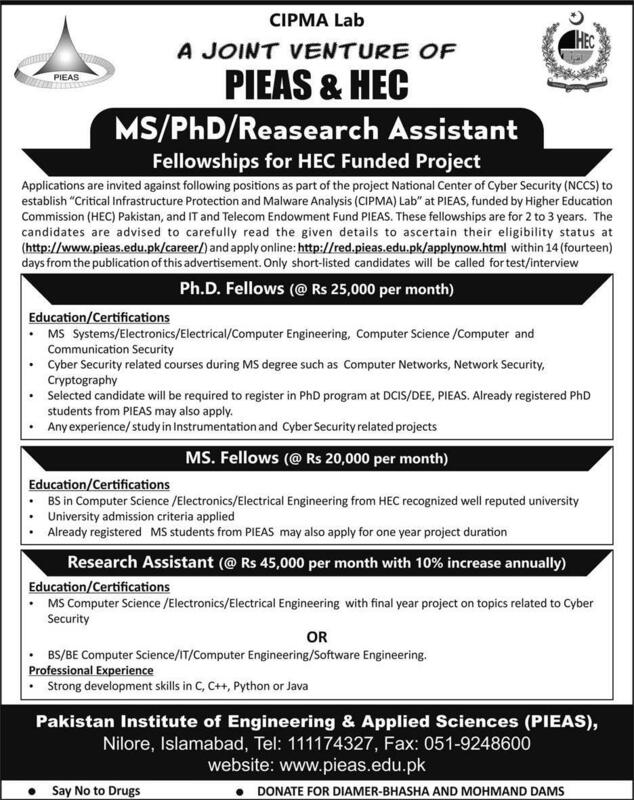 Applications are invited against the following positions as part of the project National Center of Cyber Security (NCCS) to establish “Critical Infrastructure Protection and Malware Analysis (CIPMA) Lab” at PIEAS, funded by Higher Education Commission (HEC) Pakistan, and IT and Telecom Endowment fund PIEAS. These fellowships are for 2 to 3 years. The candidates are advised to carefully read the given details to ascertain their eligibility status. i. MS Systems/Electronics/Electrical/Computer Engineering, Computer Science/Computer, and Communication Security. ii. Cyber Security related courses during MS degree such as Computer Networks, Network Security, Cryptography. iii. The selected candidate will be required to register in the Ph.D. program at DCIS/DEE, PIEAS. Already registered Ph.D. students may also apply. iv. Any experience/study in instrumentation and Cyber Security related projects. i. BS in Computer Science/Electronics/Electrical Engineering from HEC recognized well-reputed university. ii. University admission criteria applied. iii. Already registered MS students from PIEAS may also apply for a one-year project duration. MS in Computer Science/Electronics/Electrical Engineering with a final year project on topics related to Cyber Security. BS/BE in Computer Science/IT/Computer Engineering/Software Engineering. Strong development skills in C, C++, Python or Java. To more details visit http://www.pieas.edu.pk/career or Apply Online directly at PIEAS Careers by visiting http://111.68.99.201/PR. The Last date to Apply Online is 1-April-2019. View HR 1384 Jobs 2019. Why not done MS from AU Muhammad Junaid ?